I had planned this review for Friday evening, but I just couldn't tear myself away from this game. It's Yoshi's Woolly World, and it continues the Wii U's tradition of highly capable and entertaining platformers. Sure, the system is overflowing with them now, but it doesn't mean the game should be rated lower because of that. SuperPhillip Central judges a game by its own merits, and not what it does or doesn't mean for a struggling system's diverse or not portfolio of games. Here's SPC's review of Yoshi's Woolly World. Yoshi fans have had a bit of a rough go of it since the Super Nintendo classic, Yoshi's Island, released. While Yoshi's Story on the Nintendo 64 delivered quaint, cutesy charm, it didn't follow the typical structure fans of Yoshi's Island were expecting. Nintendo has since left development of direct sequels of Yoshi's Island to lesser developers like Artoon with the Nintendo DS's Yoshi's Island DS and the Nintendo 3DS's Yoshi's New Island. While these games are by no means bad by any stretch of the imagination, they lack the originality, the superb level design, and the charm of the SNES original. Now, Good Feel, hardly a lesser development as the studio is fresh off its two Wii games, Wario Land: Shake It! and Kirby's Epic Yarn, is sitting in the driver's seat, and its take on the Yoshi's Island formula is Yoshi's Woolly World. Not only does this Wii U exclusive hit many of the same high notes of the SNES classic, it actually surpasses the game in some regards. Yoshi's Island fans waiting for a true successor with bated breath can now stop and relax. Yoshi's Woolly World is the real deal. It's a lovely day as usual on Craft Island, and a myriad of adorable yarn Yoshis hustle and bustle around the island's grounds. Suddenly, a rogue Kamek zooms onto the island from the horizon, wanting nothing more than to turn each and every Yoshi into a ball of yarn. To his scheme's credit, he mostly succeeds-- save for the spare two Yoshis that hid themselves in a pile of yarn. Try as they might to pull at Kamek's sack of Yoshi yarn balls, the two Yoshis cannot stop Kamek. He escapes, though not without dropping various yarn balls along his way to a castle. The two Yoshis make chase, and thus, this woolly adventure has begun. To anyone who has played a Yoshi's Island game, Yoshi's Woolly World should be quite familiar to you. The only major difference here is that when you take damage, you don't have to worry about rescuing a wailing Baby Mario. Instead, a given Yoshi has up to twenty hearts of health, though you start just with ten at the beginning of a level. Through falling in a pit, losing all your hearts, or getting crushed, you start from the beginning of the level or from the last checkpoint you reached. hungry Piranha Plant ready for dinner below you. Yoshi has the same arsenal of moves as he did back in 1995. He just looks a lot yarn...ier. 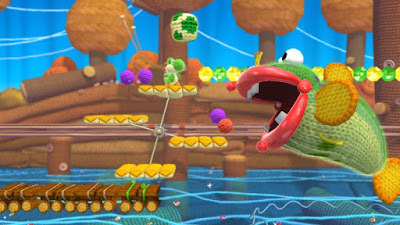 He can gobble up smaller enemies in his mouth, and decide to shoot them out or have the player press down to create a yarn ball out of them. 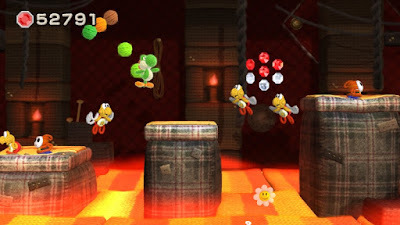 Yoshi has the ability to hold up to six yarn balls at his side, and you as the player can aim and shoot these with a target reticule. Shot yarn balls can bounce off walls, allowing for angled shots for particular tricky targets. He can also leap and flutter jump, though in Yoshi's Woolly World, a proficient flutter-jumper can do so almost infinitely instead of losing height after each flutter. Yoshi's about to take this coin purse... er... crab, out. 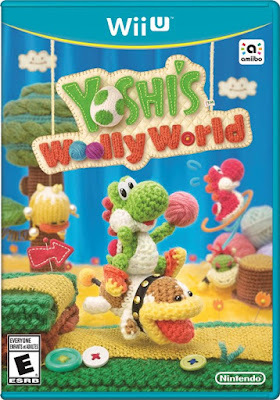 Yoshi's Woolly World reminds me so heavily of Super Mario 3D World in how it is always bringing something new concept-wise to levels, keeping players engaged from beginning to end. One level you'll be riding the sunset skies on zooming shower curtains, leaping from one to another with death-defying jumps, while another level you'll be inside a spooky ghost mansion where a scrolling pink curtain reveals platforms to walk on over a bottomless pit. The levels are constantly introducing fresh mechanics and concepts, but they're not just fresh-- they're most importantly, fun. 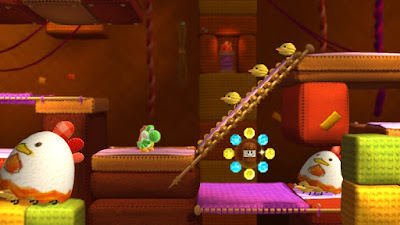 There is seldom a stinker of a level to be found, and even if a weak level presents itself, a weak Yoshi's Woolly World level could be confused for a great level in a typical 2D platformer. Thankfully, Yoshi's Woolly World is anything but typical. These hungry Piranha Plants are about to get a Chain Chomp rock in their diets. Many levels offer transformations to Yoshi that thankfully, unlike Yoshi's New Island, don't revolve around any kind of controller or gyro gimmickry. Instead, they're timed excursions that have you wading through the watery depths as Mermaid Yoshi, speeding along hilltops as Bike Yoshi, or just stomping foes under your feet with Giant Yoshi. 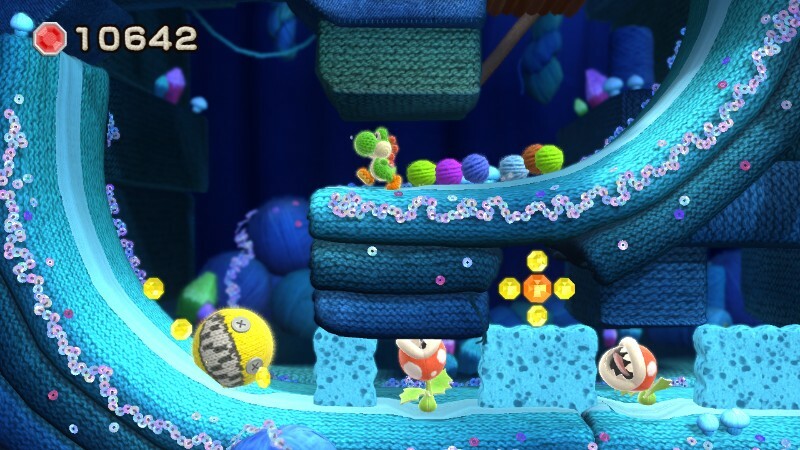 These transformation sections are a great deal of fun and add even more freshness to Yoshi's Woolly World's formula. 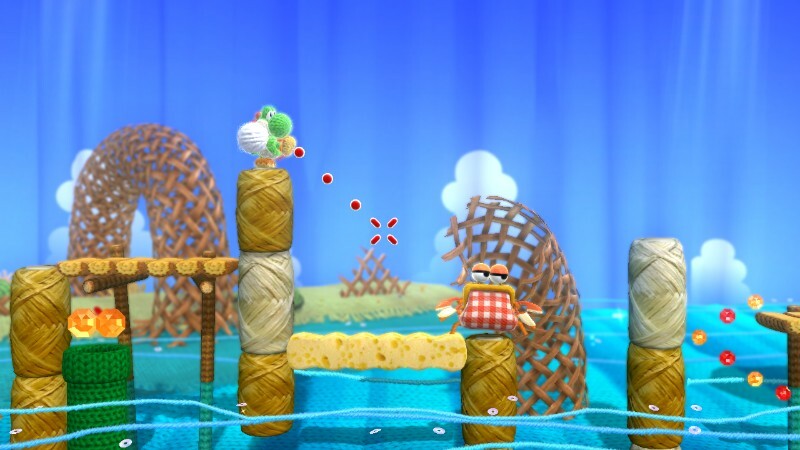 Every fourth and eighth level in Yoshi's Wooly World's six main worlds consists of a fortress and castle respectively to saunter through, taking on their trials. I mention these specifically because these levels always conclude with a boss battle of some form. The fortress levels cycle between two bosses, a giant Monty Mole and a large Paratroopa, though each new fight against them presents new challenges and ways to defeat them. Whereas the eighth level, the castle, is always against a new opponent of some type. The boss fights aren't anything overly difficult, but they can definitely cause you to take a hit or two as you learn their patterns. Overall, they're entertaining bouts, if not a bit of a breeze to beat. Many bosses use the third dimension in some regard to great effect. Simple jaunts through levels don't take too long-- and you'll find the game to be quite easy if you just run through them-- but if you want to fully immerse yourself in Yoshi's Woolly World and get the most out of it, you'll want to aim for 100% completion in each level. This is performed by collecting 20 stamps found by nabbing certain beads in levels, collecting five flowers, five spools of yarn, and also completing a level with full health, or 20 hearts on one Yoshi's life bar. Plus, a bonus here is that unlike the original Yoshi's Island, you don't have to worry about doing everything and collecting everything in one run. Nothing like losing a red coin because an errant egg hit that Fly Guy and cause it to fall in the abyss. Am I right, Yoshi's Island fans? 100%-ing a level fills you with a great sense of accomplishment and a much larger appreciation of levels because you get to better explore them, finding their secrets. It also rewards you as well with in-game content. 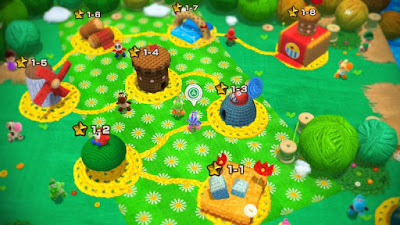 For instance, securing all five flowers in a level helps to unlock a bonus level in a world. Each of Yoshi's Woolly World's six worlds contains eight levels, and getting all the flowers in each unlocks said bonus level. In addition, finding all five spools of yarn in a level presents you with a new Yoshi design, such as a cow-patterned Yoshi, a citrus fruit-patterned Yoshi, and even some Nintendo console-oriented knit patterns. Nothing like having a world full of starred levels to make Yoshi's day. You can also use all those shelved amiibo you might own to unlock unique character patterns based off of each amiibo. There's nothing like cruising the desert world as Ganondorf Yoshi, or perhaps slipping into something more comfortable like Zero Suit Samus Yoshi. The designs are fantastic, and almost every Super Smash Bros. line of amiibo unlocks a unique outfit. (Curse you, Pokemon Company, for keeping me from Pikachu Yoshi!). With all my gushing compliments towards Yoshi's Woolly World in this review, you and I would be hard pressed to have me find something that I truly dislike about the experience. However, there is but one small issue I have with Yoshi's latest, and that has to do with the before mentioned collectibles within the game. 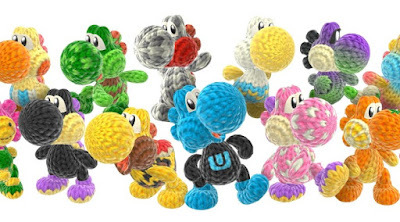 They are all fun to find, but the designers of Yoshi's Woolly World have sort of gone overboard a little bit. 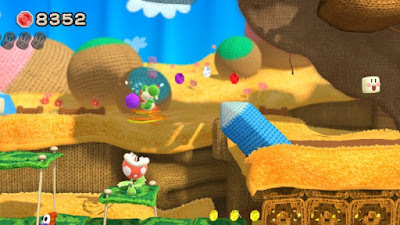 Fans of the Yoshi's Island games will know that secrets can be found in hidden item clouds that only shows themselves when Yoshi or an egg-- or in Woolly World's case, a yarn ball touches the area they are located. Many times the level designers hide collectibles inside the hidden item clouds, which means if you're not combing through every inch, every nook and cranny of each level, you're bound to miss one or two... or several, even. 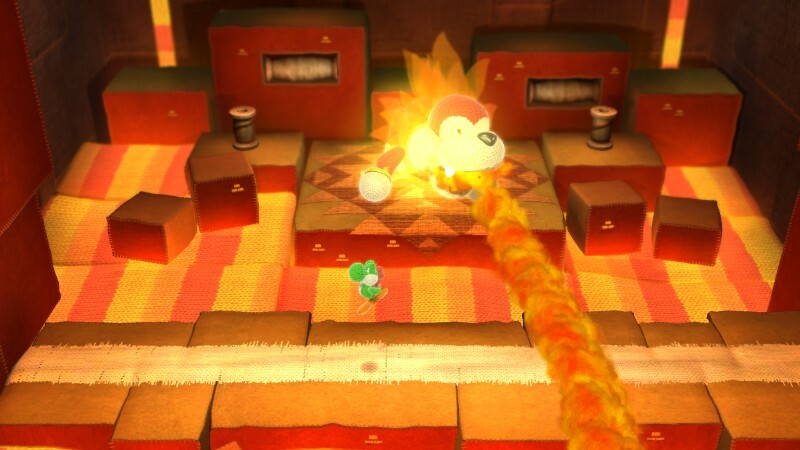 but I assure you, it's quite hot and hazardous to Yoshi. This problem is mitigated by something in the game known as badges. Badges are optional use items that can be used before the start of a given level. You begin the game with zero, but as you progress through the game, you earn new badges that can be purchased for use in a given level. These range from making your yarn balls always large, giving you more speed, having nearby beads and other items get sucked into your Yoshi like a vacuum, and something for the hidden cloud item problem. You see, there is a badge that you unlock midway through the game that shows the locations of hidden item clouds as well as secret areas (through highlighting a fake wall) and stamp locations (a bead is highlighted if that is a stamp you can collect). Spools of yarn like this lay about in precarious and usually hidden locations. Yoshi's Woolly World is an exceptionally gorgeous looking and sounding game. The entire world of the game is made up of yarn, thread, curtains, scarves, and more. I love the small touches to the world and how everything is conjured up by knitted objects. For instance, an ingenious touch is seeing volcanoes in one level's background. The flow of lava from them is actually a scarf being unrolled from the top and its body flowing like lava. It's this attention to detail and the cleverness of what objects are made of that are so amazing to me. This is a highly creative and charming game, through and through. Moreover, the soundtrack is absolutely sensational. It hits all the right notes with catchy jingles, melodies, and rhythms that stupendously set the stage and setting of each level the songs are played in. You have hard rock in the lava levels, a lovely, folksy song for a level featuring windmills, and a peppy winter jaunt featuring the game's main level theme for the outdoor snow levels. It's a fantastic soundtrack that I can happily listen to outside of the game. Yoshi's Woolly World is a phenomenal game that oozes charm and personality, delivers exceptional level design with a constant stream of interesting level mechanics and concepts, has great cooperatively play for two players simultaneously, has a good difficulty when going for 100%, and features an art style that continues to focus on Nintendo's strengths with their system's visuals. Yoshi's Island fans, you've been searching for a successor to the Super Nintendo classic's crown for twenty years now. I am happy to say that you can finally stop looking. Yoshi's Woolly World is it, and it will leave you in stitches.